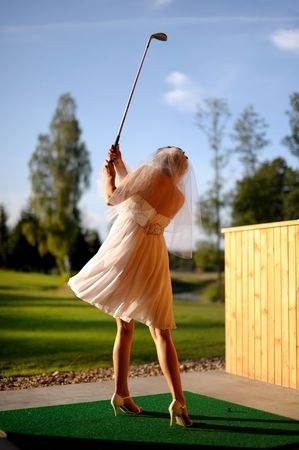 Note: It is not suggested you go to the driving range in your wedding dress. The most entertaining thing about a wedding is usually when the best man or the maid of honor divulges the most hilarious story about the couple and how it got them to where they are today. DJs or Bands do provide a source of entertainment for your guests, but what about the people who do not always want to join in on the line dancing? For those guests you may want to provide them with a difference source of entertainment: gaming. No we are not suggesting you create a video game space, instead create some games that your guests can play at the table and maybe even with other guests to get the party started. Here are two great examples to get you started! Mad Libs-You remember doing these when you were younger, you blindly pick out nouns and verbs and then fill in the spaces to create a hilarious story. There are templates out there in cyber space that you can simply print off your computer and put at each table. Your guests will have a blast filling in the spaces, at the end of the night make sure to have someone collect them so you can read them on your 1st anniversary! I Spy- This is another game all your guests can get involved on. Pre-print cards with things your guests may be looking for, such as “the bride and groom kissing” or “everyone at your table.” With this card place a disposable camera. You will laugh for hours at the pictures all your guests have taken for you. This is also a great way to have pictures of everyone at the wedding. Weddings should be a celebration, so why not do all you can to ensure everyone, even those who don’t like to dance, have fun?